The Disputatio 2014: ‘The Mediterranean, Bridge of Cultures’ took place on Thursday 27th of November in the Sant Pau Art Nouveau Site in Barcelona. Organised by UNU-GCM, together with the Barcelona Knowledge Hub of the Academia Europaea, this was the third Disputatio of Barcelona, the second one having taken place last year and the first one 750 years ago. This modern-day revival of an important medieval debate was on the theme of ‘The Mediterranean, Bridge of Cultures’. 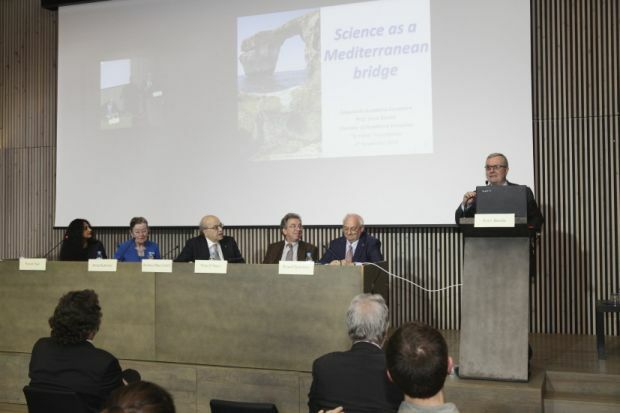 The two speakers were Maria Paradiso, Professor of Geography and Planning at the University of Sannio, Italy, who spoke on ‘The Mediterranean: Bridging, Bordering and Cross-Bordering’ while Enric Banda, Director of Science and Environment at “la Caixa” Foundation and Member of the Academia Europaea, spoke on ‘Science as a Mediterranean bridge’. 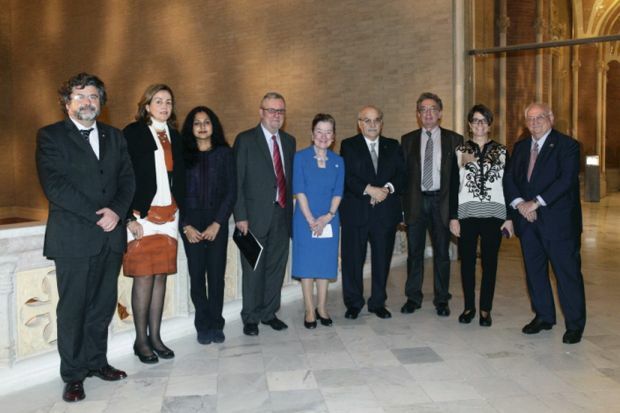 The event was opened by Anne Buttimer, Vice-President of the Academia Europea, Ricard Guerrero, Academic Director of the Barcelona Knowledge Hub of the Academia Europaea, and Parvati Nair, Founding Director of UNU-GCM. The opening remarks highlighted how this special event with a very long history, provides an excellent opportunity for the dialogue of cultures and for collaborations between academics across Europe. During the Disputatio, each speaker approached the Mediterranean from their unique disciplinary angle, raising interesting points for reflection and discussion. Enric Banda proposed science as a vital bridge between Mediterranean and European values, suggesting that it is crucial to adopt a scientific view to understand the region. In his presentation, Banda demonstrated the important geophysical transformations of the Mediterranean Sea over time and how the ‘planet on its own has tailored the Mediterranean region’. He highlighted that science is essential for addressing the current challenges of sustainability (for instance, pollution, climate change, geological and natural hazards and the loss of biodiversity) in the region. Responsible research and innovation among scientists, in collaboration with society at large, will be the way to connect both shores of the Mediterranean. Maria Paradiso, in her presentation, put forward a view of the Mediterranean region as representative of a global, mobile reality. Yet the idea of a ‘unitary Mediterranean’, she argued, is a fiction and one that has been upheld by popular visions based on cultural stereotypes. Rather than being a bridge, the Mediterranean today is a space associated with fractures, borders and securitzation, the Lampedusa migrant tragedy of 2013 a case in point. Paradiso proposes instead a view of the region based on ‘networks, crossbordering and debordering’, examining the potential of digital networks to create new solidarities and mobilities, which could reconstruct the Mediterranean as a space for the pursuit of dignity. Following the presentations, the audience posed questions to both speakers. The event was closed by Theo D’haen, Editor of the European Review who noted that ‘the Mediterranean is one of those places where history happens and keeps happening’, and by Andreu Mas-Colell, Minister of Economy and Knowledge in the Executive Council of the Generalitat (Government of Catalonia). The Pau Gil Room of the Sant Pau Art Nouveau Site, declared World Heritage by UNESCO in 1997, was an inspiring location for this modern-day Disputatio.